FOXBOROUGH, Mass. -- Who on the New England Patriots will replace Vince Wilfork? FOXBOROUGH, Mass. — Who on the New England Patriots will replace Vince Wilfork? That’s the way the Patriots are looking at it. That’s the way they have to look at it. The 31-year-old Wilfork, a five-time Pro Bowl selection and just one of two players left from the Patriots last Super Bowl championship team in 2004 (along with Tom Brady), suffered a torn Achilles tendon in his right foot in Sunday night’s 30-23 victory over the Atlanta Falcons. While he hadn’t yet been put on injured reserve by the Patriots on Wednesday, his season is over. So who replaces the 6-foot-2, 325-pound man-mountain? Wilfork is generally regarded as one of the NFL’s best players at his position, a rare combination of size, speed and agility. An interior defensive tackle, he routinely draws double-team blocks on running plays, freeing another Patriots defender to make the tackle, and collapses the pocket on passing plays, forcing the opposing quarterback to either hurry his throw or turn into another Patriot rusher. He’s even intercepted two passes. That’s why, as Gregory and Brady and Bill Belichick said Wednesday, you don’t replace Wilfork. “We’re all going to have to pull that rope,” said Belichick, who selected Wilfork out of the University of Miami with the 21st pick of the 2004 draft. “There’s no Vince Wilfork, you just don’t replace Vince Wilfork. We’ll still have his presence around the team and in the locker room and those types of things, which he’s great at. Joe Vellano, an undrafted rookie free agent out of Maryland, and Chris Jones, a rookie out of Bowling Green picked up on waivers on Sept. 11 after Tampa Bay dropped him, will be the first two guys to step in. Veteran Tommy Kelly, who has already made a huge impact on the defense, will likely see his playing time increase. But, Belichick stressed, this is about all 11 players on defense stepping up. 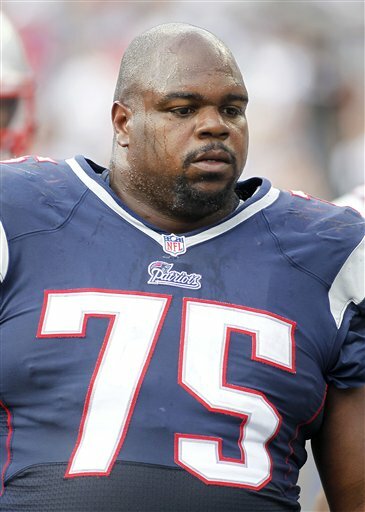 Wilfork’s stats weren’t eye-popping this year: 10 tackles (six unassisted) and one quarterback hit. But his presence gave everybody confidence. Vellano, who had a big sack of Matt Ryan after replacing Wilfork against the Falcons, spoke Wednesday about how much he has learned from Wilfork in the short time they’ve been teammates. “I couldn’t have asked for a better mentor,” he said. It’s that leadership that’s going to be missed most. When things got difficult for the defense, Wilfork was always one of the first players to step up and do something. Whether that meant making a play or making a speech, it didn’t matter. He did it. Brady figures Wilfork — who had surgery Tuesday (and his wife, Bianca, posted a photo of him giving a big thumbs up on Twitter, meaning it went well) — will probably still be around to give advice, to help in any way he can. That’s the type of person he is. But Brady said the Patriots can’t dwell on his loss. Time doesn’t allow it. “His presence in the locker room, on the field, will be missed,” Brady said. “At the same time, the train keeps moving. No one feels sorry for the Patriots. We have to keep fighting on, just as Vince would want us to.